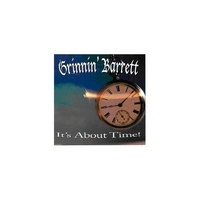 The ‘Grinnin Barrett Band’ is based out of Southern New Hampshire, USA. Our recently released Album: “IT’S ABOUT TIME” has been getting a lot of attention and great reviews along with our newer material now available for digital download. The current line up of musicians in the band is as follows: John Barrett on drums and percussion, Tom Barrett on guitar and keys, Garette Barrett on guitar, Bill Barrett on bass, and Michael D Barrett of 3MiMusic.com, who is also our producer. As a band, we pride our selves on tight harmonies and tight pocket grooves and are constantly writing new material all the time and we set no limitations as to a certain format. We write our songs from the heart and express our feelings accordingly. We joined my space in July of this year 2007 and we are having a blast since we signed up: Log on to: www.GrinninBarrettBand.com We are constantly acquiring new friends on a daily basis from all around the world, and we welcome all artists and friends who would like to join us and share in our joy. It is indeed a pleasure to bring our music and our dreams to the global community. For everyone knows that “Music” makes the world go round. And just think, what would Heaven be like without the ‘choirs of angels’ who are now competing with American Idle to be the next Rock Stars of the Universe.